All information and documents provided within this Website are provided without warranty of any kind. 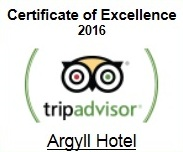 Argyll Hotel Glasgow assumes no liability or responsibility for any errors or omissions in the content of our Website. Your use of this Website is at your own risk. In no event will Argyll Hotel Glasgow be liable to any party for any direct, indirect, special or consequential losses or damages arising from the use of this Website or any information contained therein or from accessing any other linked Websites, including, without limitation, loss of profit, business interruptions, loss of programs or other data on your information handling systems. This Website may contain links to third-party Websites. The linked Websites are not under the control of Argyll Hotel Glasgow, and Argyll Hotel Glasgow is not responsible for the contents of any linked site or any link contained in a linked Website. Argyll Hotel Glasgow is providing these links only as a convenience, and the inclusion of a link does not imply endorsement of the linked Website by Argyll Hotel Glasgow. For information on our booking and cancellation policy, please contact us.